Taco Dinner Delayed by Crappy Clasps! Does wrestling with frustrating chain clasps drive you to drink? Who hasn’t had an issue with a chain clasp from hell? I’ve had lots of them. There’s nothing more frustrating than rushing to get dressed for dinner at your favorite taco place, and then wasting time trying to put on your necklace with a clasp that just won’t work! Argh! 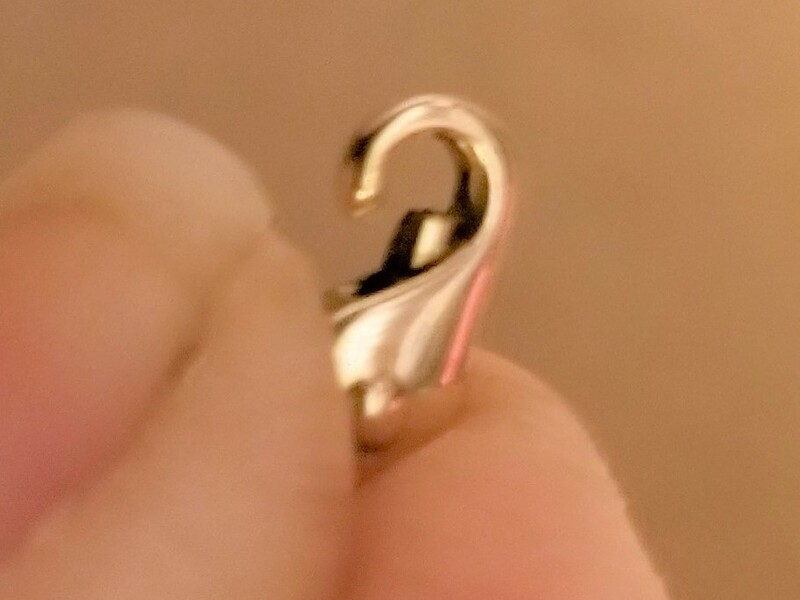 Somehow, the hook thingy just won’t fit into the tiny ring on the other side. What’s up with being saddled with a crap clasp? I replace chain clasps regularly on chains, necklaces, and bracelets. It’s one of the most common fixes I do. I’ve had lots of practice! So I’m jumping up on my soap box to discuss clasps gone bad and giving you advice on what to do about it! The most frequent problem with clasps—and the rings they hook into—is that they are too small. The average human female finger can’t manipulate clasps the size of a grain of rice or end rings the size of the head of a pin. And yet they sell them to us. This is so wrong. As we age, our fingers tend to become less dexterous. Tiny clasps that we were able to cope with when we were seventeen, may not be as easy at sixty. 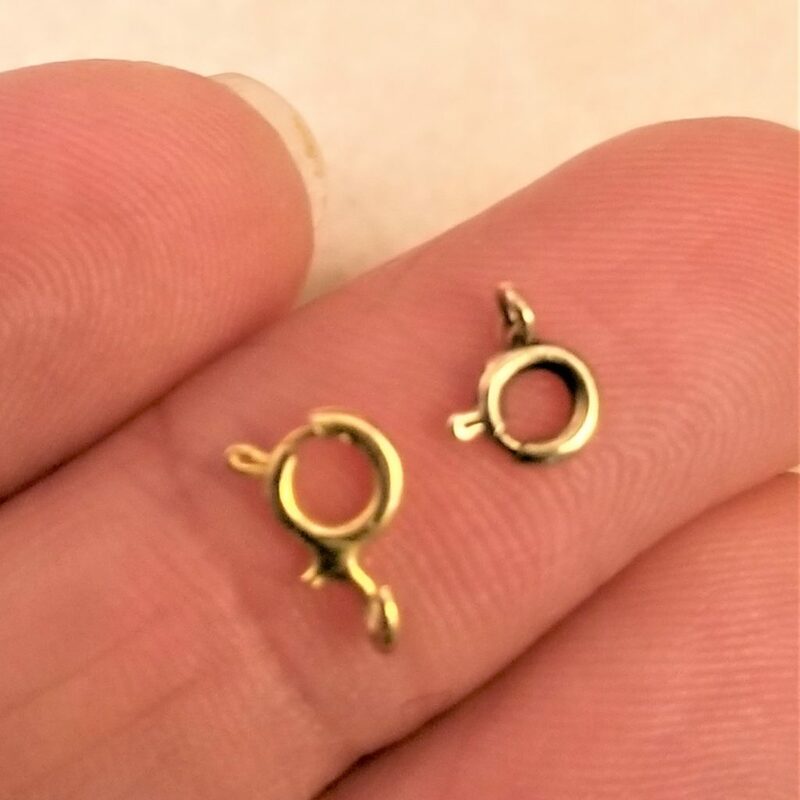 I recommend replacing your tiny clasps and end rings with larger ones. What good is your necklace, if you can’t put it on or take it off comfortably and easily with your smile intact? Many of my client’s with barely there or weak fingernails find pulling open a traditional clasp too difficult or painful. My dexterity challenged clients also find normal clasps too difficult. Their options for clasps include magnetic clasps, Push-locks and hook styles. This section focuses on alternative clasps. Another option is some sort of hook style which doesn’t require much manual dexterity. The hook clasp is a great choice for heavier and thicker chains. They are quite easy to use. I personally find them easier to use than push-locks. However they run the risk of allowing the chain to fall back through since the closure is open. This seldom seen push-lock was invented to help the arthritic to open and close their clasps with no fingernail action needed. Push-lock clasps allow you to press on your clasp to open it. There is a little rounded part that you can push on and the spring loaded piece retracts for opening and closing. The Push-Lock above does require you to have good feeling in your finger tips to detect the very small bump you need to push down on to open your clasp. It’s advantage is its beauty. Many of my client’s have ordered it not just for the ease of opening, but for its pretty and smooth look. A little bar slips into a hole and locks in place until the bump is pushed to release the bar inside. These are usually used with thicker style chains. Installation is more complex, so use this on special chains. 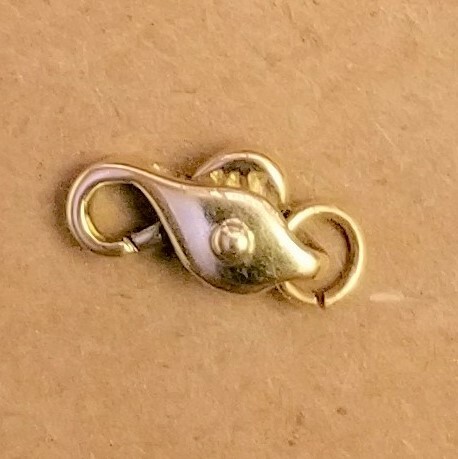 This lock looks like normal lobster clasp, but it is made for people who don’t have the fingernail strength to pull back a normal lobster clasp pull tab. This push-lobster has a higher and easier to manipulate push bump. 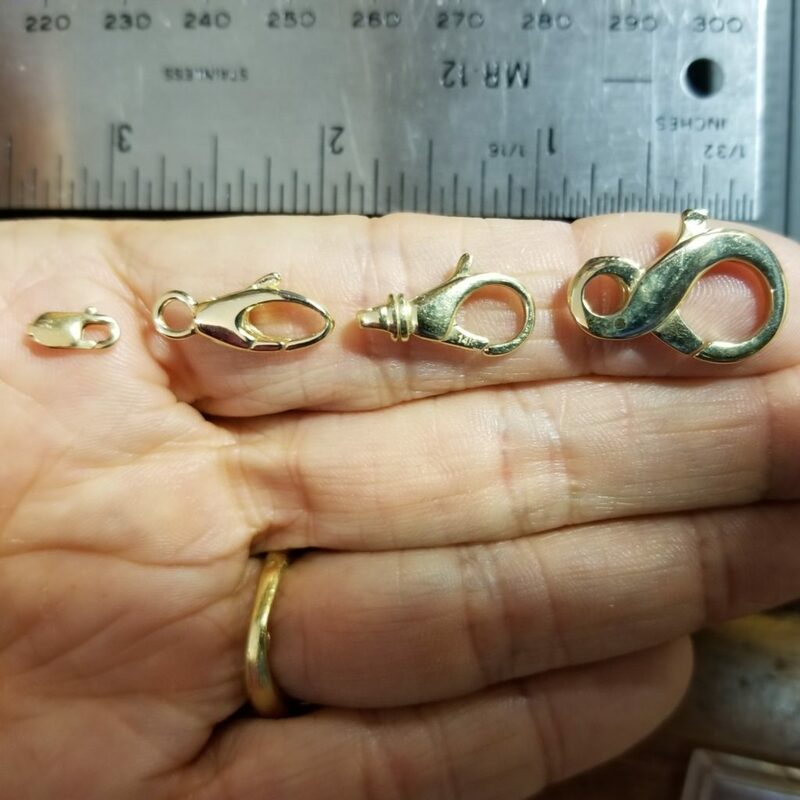 For traditional chains these push lobster clasps are easy. They install with the same method as normal lobster clasps. They offers a nice and easy way to open a clasp. 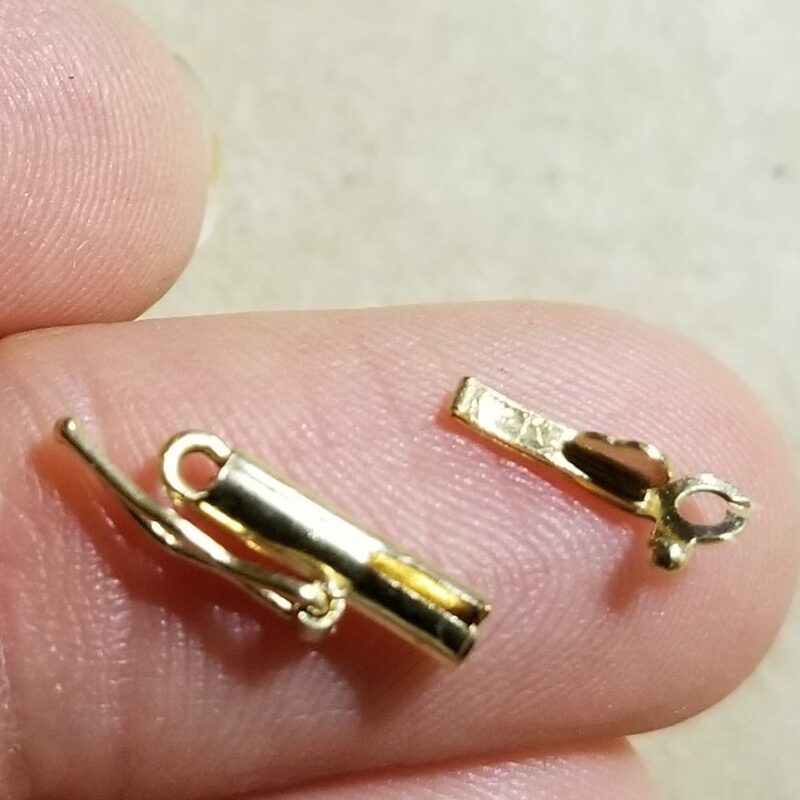 Why Do They Make Undersized Clasps? You may be thinking: why put undersized clasps on chains to begin with? I think the reason is cost. 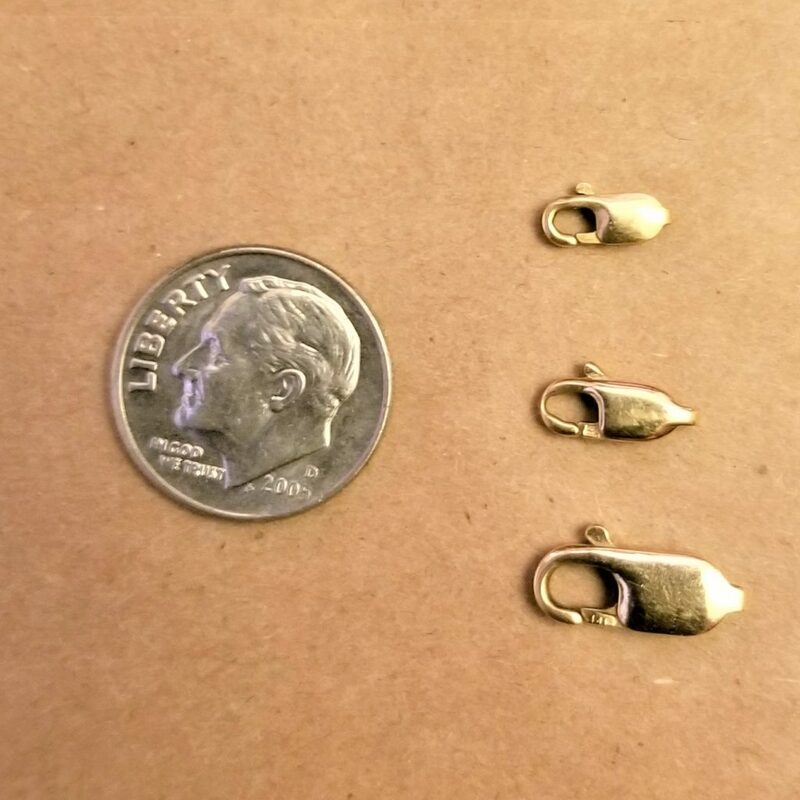 Less gold goes into creating a 4mm long clasps than 6mm long clasps—especially if you’re making thousands of them. 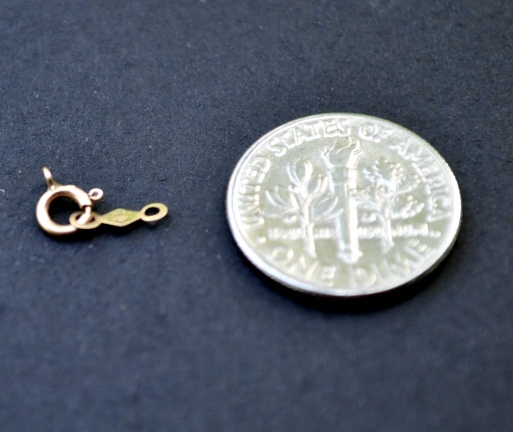 Attaching the 4mm clasp to the chain will cost significantly less than attaching a bigger one. The fact that you’ll rediscover cussing while trying to put it on isn’t in their budgetary considerations. With Acrylic Nails You Need Better Clasps to Manage your Necklaces. It’s a problem women run into all the time when the clasps have very low opener tabs. Mostly on lobster and spring ring clasps. 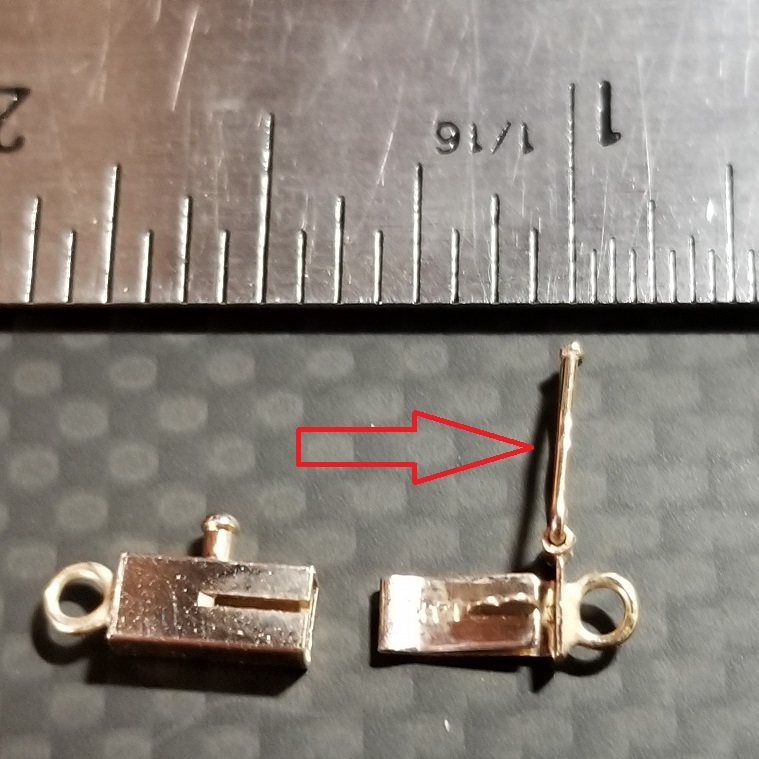 I’ve seen some tabs that were almost flush with the body of the clasp, making it all but impossible to hook a fingernail on it and pull it back. Not Fair! 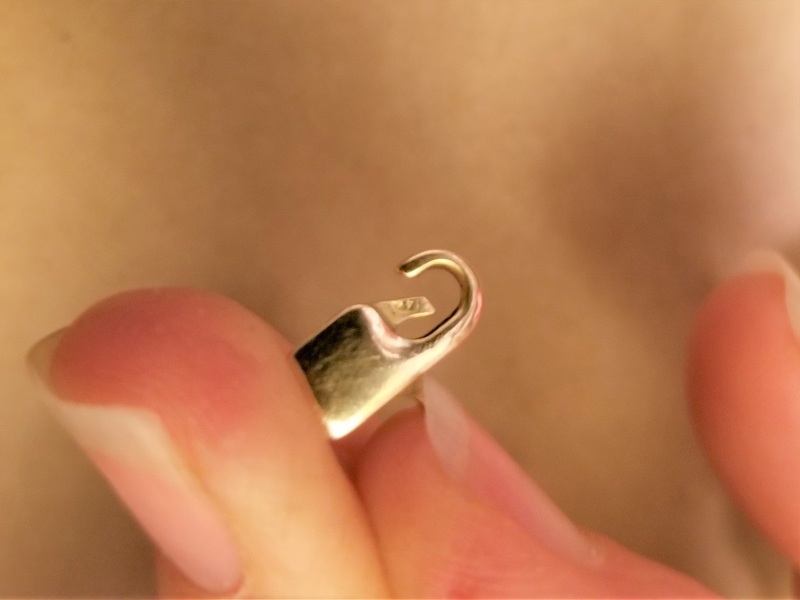 If you plan to use acrylic nails always test the pull tab of clasps before you buy that chain. 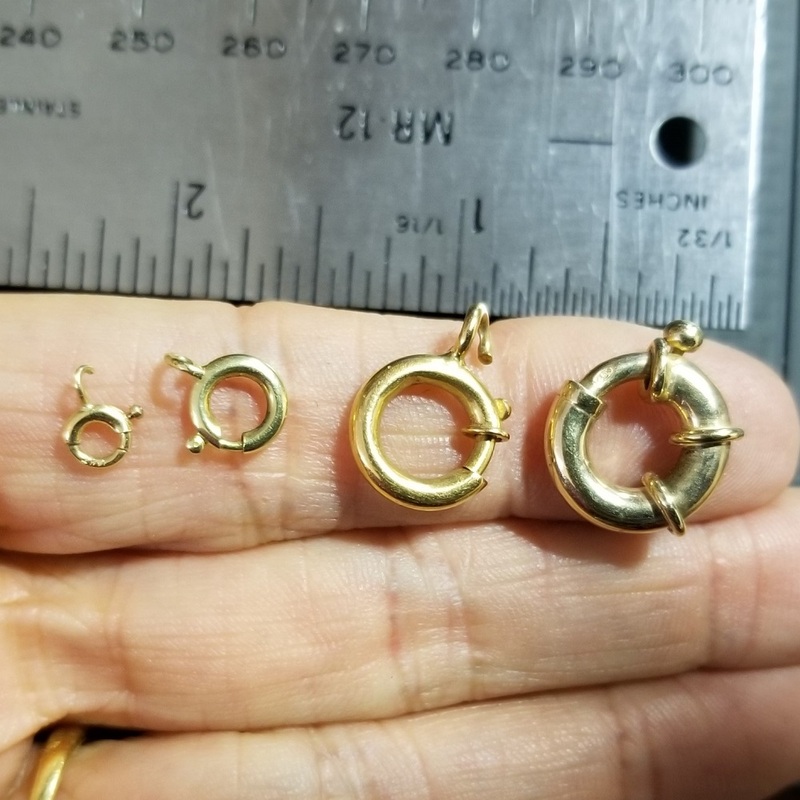 If you have chains with too low of pull tabs, get your favorite jeweler to find you proper clasps with tall pull tabs. Possibly the Worst Clasp Design of All Time – The Barrel Clasp! This clasp from hell and possibly the blue ribbon winner of all time, is the barrel clasp. It’s round in shape and lightweight, that’s good. But using it is a nightmare. Trying to line up the two pieces, so the fin slides into the invisibly-tiny-opening on the barrel, is predictably, the biggest challenge for me. That safe looking safety catch drew me in. Then after having one and struggling with it for a year, having my hair get caught in the safety and then finding the safety flopping unconnected later in the day, I asked myself, “why am I putting up with this awful clasp?” Actually I may have said something more salty. Like their name suggests box clasps are often rectangular and like a box. They have a tongue that slides into the box and locks with an audible click. 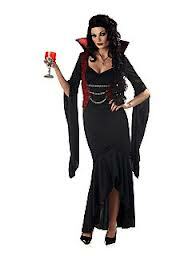 The generally have a safety clasp along the side. 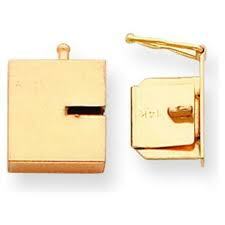 When clasps have an angular shape like the pictured box clasp, they are much easier to use. Finding the line for the fin to go into is much easier to do without looking. Having a figure eight safety clasp is a pretty wonderful thing as well. I do want to warn people with long, especially fine hair, that the box clasp with its figure eight safety clasp offers two different opportunities for your hair to get caught. A box clasp is fairly easy to use and is great, unless your tongue (the sticky in-y part) gets worn out. A problem I’ve dealt with many times with box clasps is worn out tongues that no longer hold the two ends together. This results in clasp malfunctions and your precious bracelet ends up lying in the gutter or falling onto the asphalt between cars in big parking lots! If that tongue doesn’t have an audible snap when you close it, don’t wear it. Fix that clasp! When you are buying a chain or bracelet with a box clasp, make sure it gives an audible click when closed so you’ll always be able to listen for it. That click is how you know that your tongue is OK and holding on and locking properly. There are a lot of varieties of the lobster clasp style. This is because it is a very secure and easy to use clasp. Unlike the circular spring ring which is lighter weight in general, the lobster tends to have heavier and longer lasting springs. Many of the varieties offer taller pull tabs that make them quite easy to use. An old lobster clasp of mine finally broke. The spring somehow wiggled out of its spot, allowing the closer end to flop open. Even though I wore it like that for hours the chain stayed on. 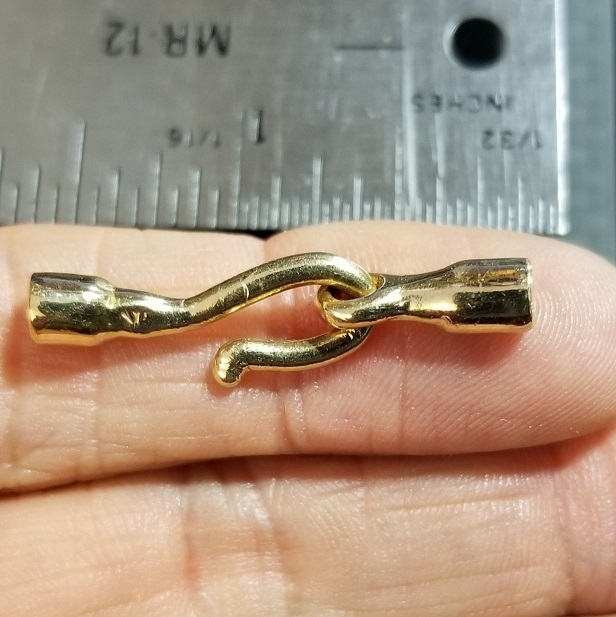 This is because there is a good bit of curving distance down the clasp that the chain opening ring has to go down, to get out of the clasp. My chain stayed safe. Thank you Mr. Lobster clasp. Everyone has their favorite clasp style. Mine is a squarish lobster clasp. These are different from the tapering back lobster clasps. The squarish style is more stable when you are holding the pull tab back while putting it behind your neck. I also like it to have a pull tab that’s high enough to easily feel and pull back with my nails. My client Marta’s daughter was given a bracelet and she wanted to wear it all the time. Marta had seen how her seven year old fussed with things and took old toasters apart and she wanted a strong reliable clasp that would be such a pain to remove that little Dessa would leave it along. The sister clasp is such a clasp. It is often times used on medic alert bracelets. 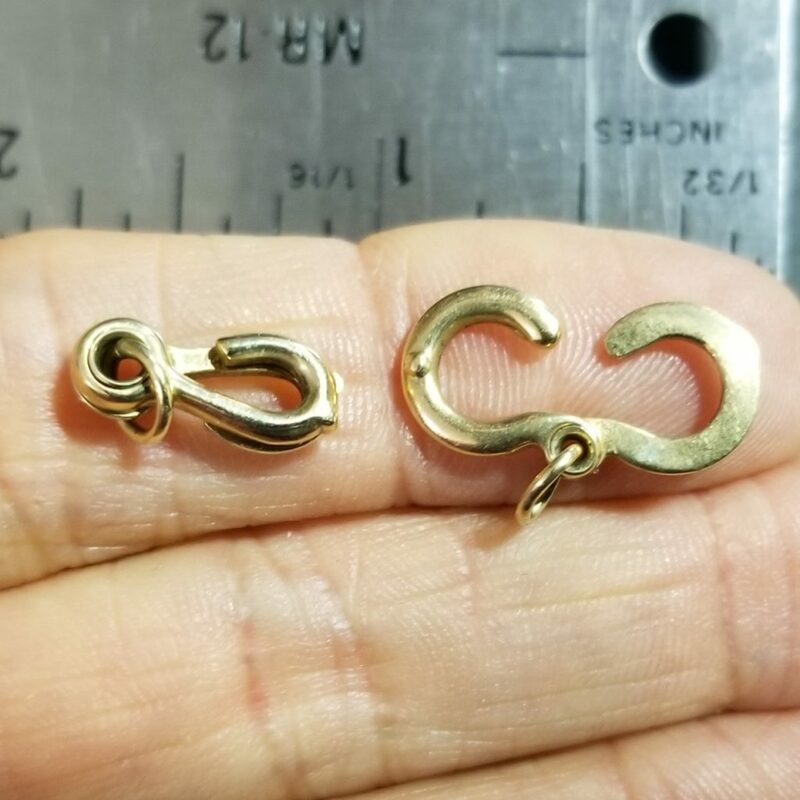 It is such a challenge to line up the curving pieces so they both open at the same time to release the link, that I’d never give it to someone unless they intended to wear that bracelet daily. Every clasp I have in my collection has been customized with a nice larger than normal end ring. Sometimes your clasp is fine, but feels problematic because the end ring you need to hook it to is too small. 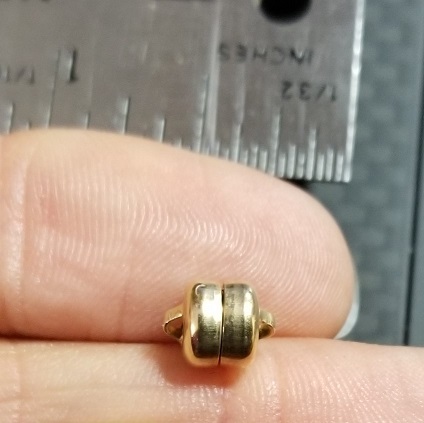 If you are in doubt about getting a larger clasp, try getting a larger end ring first. Wear It, Don’t Warehouse It! The moral of this story is; you don’t have to live with the clasp that came with your necklace or bracelet. Clasps from hell have ruined many a piece of jewelry for women I know. A better chain clasp was all they needed to wear and love their previously irritating chain or bracelet. It’s an easy fix to get a bigger or different style clasp. I have noticed more than once, during my work with my Wardrobe Wisdom clients, how a dysfunctional clasp can keep women from wearing their much beloved jewelry. Calla Gold is a genius at coming up with practical and attractive solutions which encourage you to wear those pieces that have been languishing in your drawer, like a creepy dead spider. I love this post Calla Gold, because it is so true to what happens with these silly chain clasps. It’s the simple things in life that can make such a huge difference, especially when you’re headed out the door and wanting to wear your favorite bracelet or necklace and can’t seem to hook it on! I know this is going to sound weird but I have never even considered the idea of changing a clasp on a piece of jewelry! This will change the way I look at my jewelry…. wow. How do you work with long distance customers? And do you do other than clasps? Moms knuckles are large and she needs her ring sized up to a much larger size. Any suggestions? Where do I get parts for us regular folks without a liscense? Platinum? A BIG Thankyou Calla! Sharing your knowledge is generous, and very much appreciated!